Bradbury and Pohl with the Red Planet. Photo by Terry Pace. I saw Ray last a couple of years ago, when he and I were joint guests for the science-fiction program at UC-Riverside. He was feisty as ever, rather startlingly denouncing current science fiction as trash or worse — though it turned out that what he meant to be denouncing wasn’t print science fiction, but only the current crop of sf films. I would have liked to go into that in more detail, and to ask if he included the film Avatar. But time didn’t permit, and now I never can. 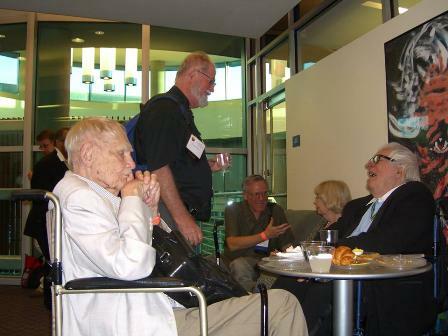 Fred Pohl, Larry Niven and Ray Bradbury at the 2008 Eaton Conference. Photo by Terry Pace. This entry was posted in In Passing and tagged Eaton Conference, Frederik Pohl, Larry Niven, Ray Bradbury by Mike Glyer. Bookmark the permalink. That’s Larry Niven standing up behind them, in the second photo. Do we know who the other two seated people are? It has been five years but I think the two sitting were UCRiverside Archivists. I’m there in the background. I was wondering why people were trying to figure this out. Then I discovered I wrote the caption on a data line, not one that displays in the post. Fixed now. If you look real close at Ray’s leg under the table you will see a little corner of a book in his lap. The book is Project MARS by Dr. Wernher von Braun. The book was given to Ray by von Braun and inscribed to Ray.